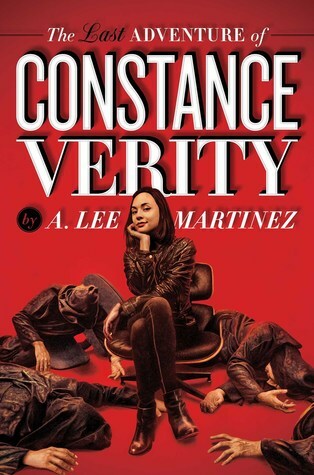 Ah, Constance Verity. This was such a funny book. Going incognito as “Connie Smythe”, our protagonist begins this tale by attempting to kick off her “ordinary” life by getting an “ordinary” job. However, the moment her would-be employers discover her true identity, the seemingly everyday interview takes a turn for the bizarre as they try to dispose of Connie by sacrificing her to the Hungry Earth monster. Trouble just seems to follow Constance everywhere, much to her annoyance. All she wants to do is live a normal existence, but just how is she to do that when disasters like alien invasions, time traveling supervillains, or space pirates just keep falling into her lap? The truth though, is that this has been the case for most of Connie’s life. Whether she likes it or not, she is destined for heroism and adventure, thanks to a gift granted to her at birth by her fairy godmother. But now Connie has had enough, and just wants to settle down. Unfortunately, her blessing (or curse?) 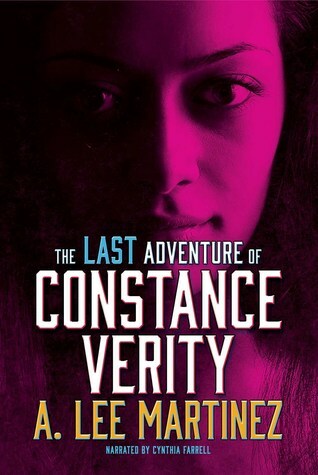 isn’t going to let that happen, so she’ll have to do something extreme: Constance Verity is going to kill her fairy godmother and take back control of her life. The cover image of the Saga Press edition was what first drew me to this book. The moment I saw it, I could not help but be intrigued. Why is this badass-looking woman smiling so smugly at the viewer, surrounded by a bunch of unconscious cultists? I just want to know, DAMMIT. 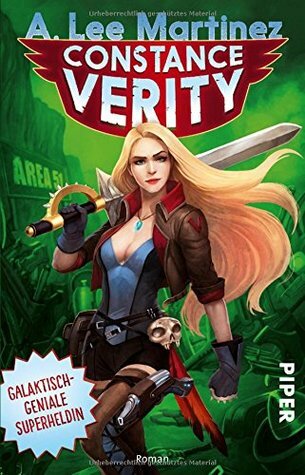 The German edition is another strong contender, and the “comic” style of it might actually be a better fit for the story’s tone. In contrast, the one cover that I felt was all wrong for this book is the Sci-Fi Audio edition. The only thing I like about it is the color, otherwise it’s boring as hell and tells me nothing about the novel’s humorous and comedic nature. So, the choice for me was easy this week. But what do you think? Which one is your favorite? I kinda like the Sci Fi Audio one, but I think it’s because of the purple on black, and that actually makes it look like a darker read? Whereas it sounds like this is more humorous or fun than dark, so I think you’re right, probably not the best choice to reflect what’s actually inside the book! I do love the color of the audio edition, but yeah, it honestly looks like it could be the cover of a thriller because it’s so dark! I was thinking more along the lines of psychological thriller, but your description made me laugh 🙂 But no, the actual story is nothing like either, so yes, it’s a misleading cover all around. I can’t say that any greatly appeal but I’d go with the German cover. It’s easy for me to like the Saga Press one too – it’s the one that intrigued me to buy it! I agree, I love the red cover best. It’s time for me to read this author again, it’s been years! I also need to seek out more of his work! Somehow I’ve never heard of this one, looks fun! I love the cover you went with best too. I picked the same cover as you. I like the comic book version too but not quite as much. The middle one is very bleh. Totally bleh. Pales in comparison to the other two!